New York, NY – April 6, 2015 – Kino Lorber is proud to announce the highly anticipated DVD and Blu-ray release of A Girl Walks Home Alone at Night , both scheduled with an April 21 street date and a SRP of $34.95 (on Blu-ray) and $24.95 (on DVD). The film's Blu-ray brings over two hours of special features (138 minutes, to be precise), as well as a collectible version of the first two issues of the comic book, written by Ana Lily Amirpour and drawn by Michael DeWeese, being published by RADCO. After grossing over $420,000 in US theaters and playing in more than 75 markets, Ana Lily Amirpour's feature debut is ready for its home media release. Loaded with special features, the film's Blu-ray comes with a behind-the-scenes documentary produced by Vice (20 mins. ), a talk with Ana Lily Amirpour and actress Sheila Vand, hosted by Vice's Eddy Moretti (31 mins. ), and some additional behind-the-scenes footage (20 mins.) – all exclusive to the Blu-ray being released on April 21, 2015. In addition, both the Blu-ray and DVD editions feature deleted scenes, a stills gallery, the film's official trailer, a Q&A with Amirpour, hosted by Roger Corman at the Hammer Museum, and an exclusive essay by Indiewire film critic Eric Kohn. Dubbed the world's first "Iranian Vampire Western," A Girl Walks Home Alone at Night is a joyful mash-up of genre and prolific influences spanning spaghetti westerns, graphic novels, horror films, and the Iranian New Wave. While comparisons have been made to Jarmusch, Lynch, Tarantino, and Sergio Leone, the film is wholly original and refreshingly daring, signaling the arrival of a bold new voice with writer/director Amirpour. 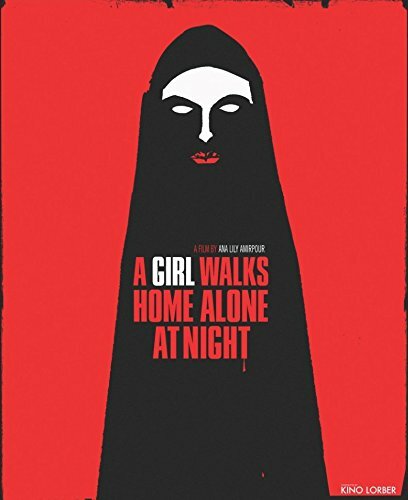 A Girl Walks Home Alone at Night also features an impressive cast of actors including leads Sheila Vand (Argo), Arash Marandi (Kunduz: The Incident at Hadji Ghafur) and Dominic Rains (The Taqwacores), as well as Mozhan Marnó (House of Cards, The Stoning of Soraya M), Rome Shadanloo, Marshall Manesh and Milad Eghbali. The film is rounded out by the sumptuous, black-and-white anamorphic cinematography of Lyle Vincent and a soundtrack that features the Middle Eastern fusion beats of Bei Ru, the underground Iranian rock of Radio Tehran and Kiosk, and the spaghetti western-inspired tunes of Portland-based Federale.